Cookbooks fly in and out of the library, sailing across the circulation desk. Their glossy covers tantalize my imagination and whet my appetite with seductive photos and suggestive recipes. I’m lured, tempted, and enticed to experiment! Of all the genres, it’s the culinary arts that push my buttons and get me motivated. Whether I try a recipe or just read up on techniques and trends, the Everett Public Library’s motto to INSPIRE, INFORM, and ENTERTAIN feeds my cookbook enthusiast passion. Local restaurateur legend, Tom Douglas and co-author Shelly Lance, have won me over in compiling The Dahlia Bakery Cookbook. I’ve raved about this cookbook, checked it out numerous times and recently became the owner of said cookbook thanks to my sister. I’m in heaven! 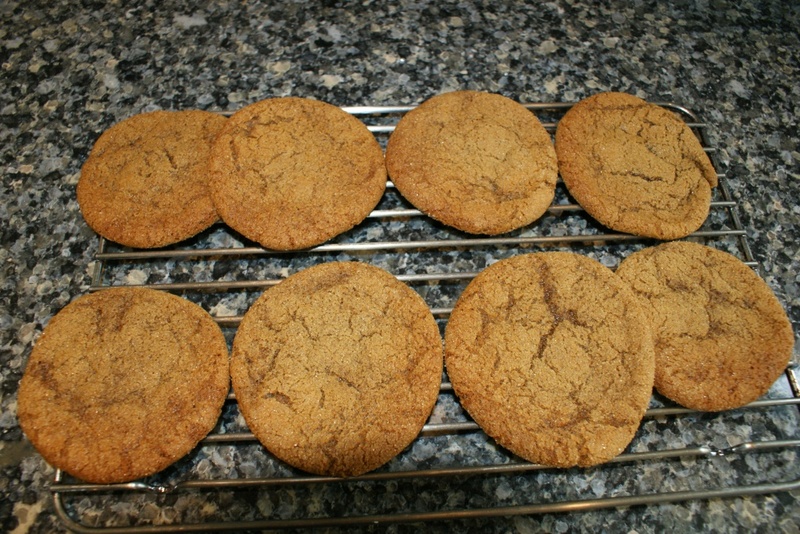 The old-fashioned molasses cookie recipe with fresh ginger is what turned on my taste buds (see recipe below). They are delicate, chewy, and slightly crisp around the perimeter. These versatile cookies go well with a cup of tea or pair wonderfully with a chilled glass of Jones Late Harvest Riesling. If you like this recipe you may also enjoy the cranberry apricot oatmeal cookies, at 4 inches in diameter these cookies impress! Personally I’m a bit intimidated when it comes to ‘baking’, more science than art and not my strong subject. Tom concurs that baking requires skill and gives credit to Shelly who is the head Pastry Chef at the Dahlia Bakery establishment on 4th Avenue in Seattle. As a side note several of Chef Douglas’s restaurants are near the bakery. One is Lola’s where my husband and I dined during Restaurant week. The chocolate dessert I had was otherworldly! Currently, I have on loan two alluring cookbooks: Le Pain Quotidien and One Good Dish and both look a bit exotic. Borrowing cookbooks from the library sometimes leads to adding a well-loved cookbook to my home collection. The Food Matters Cookbook, by Mark Bittman is one such book. I use Bittman’s recipes on a regular basis because a lot of them offer healthy options with substitutions (If you don’t have this you can substitute using this). My confidence is growing as I try new recipes and mix things up expressing my creativity. I encourage you to come in and checkout one of the many excellent cookbooks at the library. There is something for everyone’s palate. Bon Appetite! 2.In the bowl of an electric mixer with paddle attachment, cream the butter and the sugar on medium speed until light and fluffy. 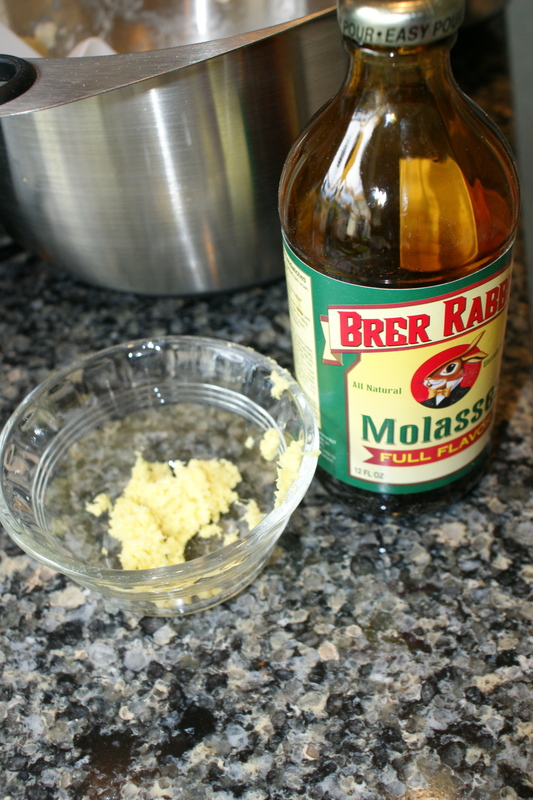 Add the egg, molasses, and ginger mix to combine. In a small bowl, combine flour, baking soda, salt, and cinnamon. Add the dry ingredients to the wet ingredients and mix to combine. Refrigerate the dough for at least an hour before shaping the cookies. 3. Sprinkle about 1/2 cup sugar on a plate. Form 3/4-inch balls of dough and roll balls in the sugar before placing them on parchment-lined baking sheets. Press the balls of dough flat with the palm of your hand. The cookies should be spaced 2 or 3 inches apart after they are flattened. 4. Bake until golden brown and set around the edges but still slightly soft in the center, 7 to 8 minutes, rotating the pan halfway through the baking time. If you have two pans of cookies in the oven at the same time also switch them between the racks. Remove from the oven allow cookies to cool before removing them with a metal spatula. 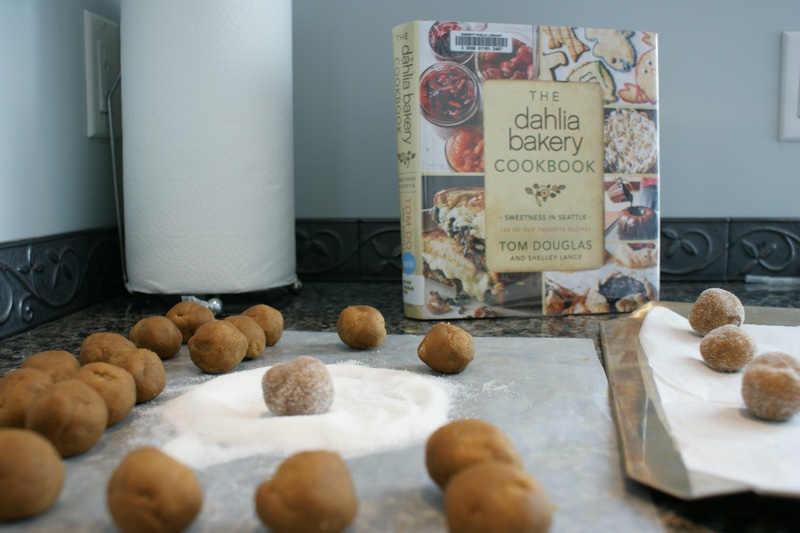 This entry was posted in Cooking, Nonfiction and tagged baking, cookbooks, Dahlia Bakery Cookbook, Seattle by Margo. Bookmark the permalink.